The Earth is covered with rocks. When you look at a rock, you’re looking at history. At one time, all rocks were molten rocks. With pressure and heat, minerals squeeze together. We can get a new type of rock like marble. Wind and rain can break rocks down into sand. When water flows through dust and sand, it mixes sand together. The sand dries out and can turn back into rocks again. This process where rocks are formed, broken down and reformed has been happening for billions of years. 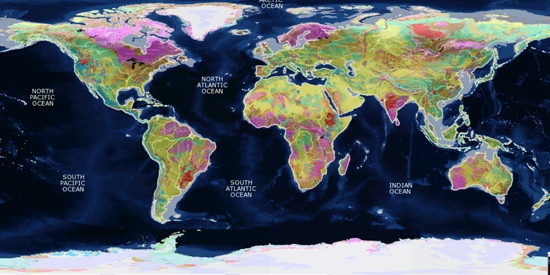 Here’s a list of the best global geology maps found online. We can better understand our Earth with geology. For example, we can begin to understand phenomena like earthquakes, landslides and precious minerals with geology. This is why mapping geology is important. Geologists divide time into eras, periods and epochs. For example, cenozaic era rocks were formed from 65 million years ago to the present. These rocks were created from recent volcanic activity. When looking at geology maps, you’re looking at the underlying rock formations. In other words, it displays rocks of different ages showing eras, periods and epochs. And it may include the three main types of rocks: sedimentary, metamorphic and igneous. The USGS Tapestry of Time and Terrain merges topography (hillshade) and geology into a single image. Geologic events like continental collision, mountain-building and river erosion are remarkably outlined from the past 2.6 billion years. 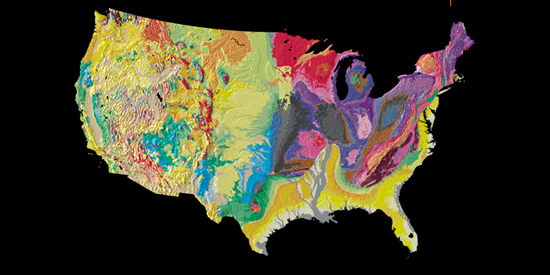 This composite is the most detailed and accurate portrait of the US land surface and the ages of its rock formations. Where ONE Geology lacks in sheer elegance (see above) it makes up with usability and complete global coverage. OneGeology Portal enables data accessibility to everyone which is pretty powerful. 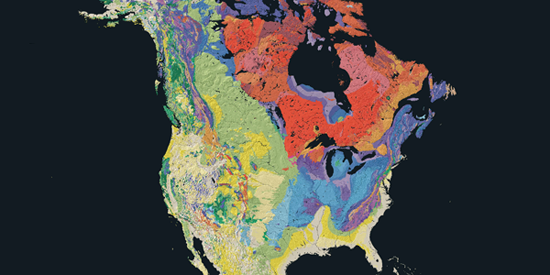 At your fingertips, you can see geologic maps with data consistent across the globe. Like most ideas that catch the imagination, it was simple, basic and unifying, but most of all it was timely.. Imagine getting a look at the geology under the ocean. 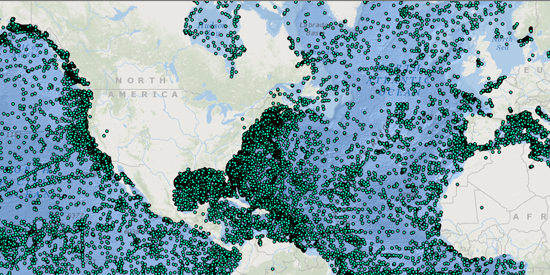 The NOAA Marine Geology Viewer lets you do exactly this. Based on geology surveys from sediment data reports, you can cruise geology from the ocean floor. Rocks have a long history. Actually, much longer than human beings. They were formed in different eras, periods and epochs billions of years ago. Earth is covered in rocks from different ages. On this fact alone, it’s pretty amazing that you can see exactly where with geology maps. 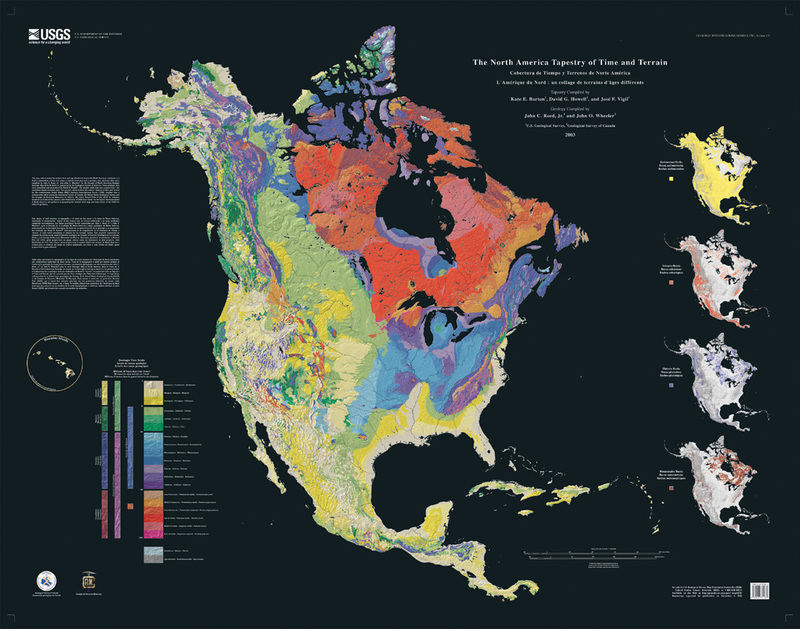 If you ever wanted to take a peek at the best geology maps, you can’t live without this list of 3 geology maps.